Hotpot Software today announced the release of President Forever, the latest version of a highly acclaimed presidential election game/simulator for Windows 98/Me/2000/XP, available immediately for $12 (USD). 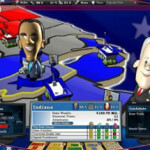 With its in-depth and realistic play experience, President Forever lets you master political intrigue and election struggle while taking your candidate all the way to the White House. "Building on our experiences with the 2000 campaign, we have done our best to recreate the intensity and challenge of a real presidential campaign," said Anthony Burgoyne, President of Hotpot Software. According to Mr. Burgoyne "President Forever is an excellent choice for those who want to have fun while trying to figure out what is running through the minds of George Bush and John Kerry’s campaign managers."